There was potential for air quality impacts on human and sensitive ecological receptors, as a result of additional road traffic exhaust emissions and potential process emissions. Due to the chemicals used in the production facility, the development required a bespoke non-standard environmental permit. 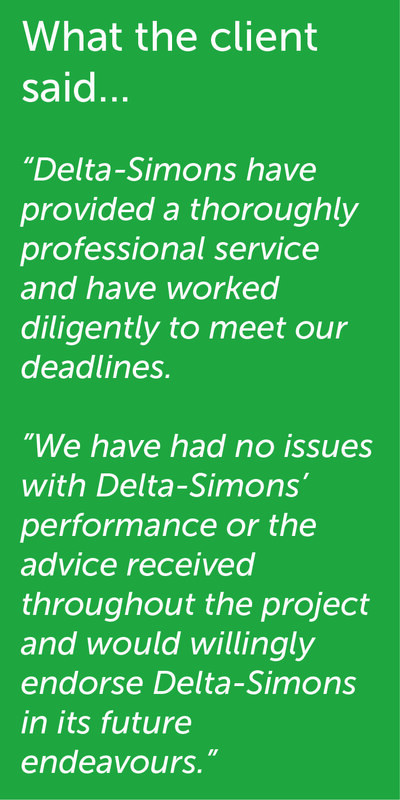 Delta-Simons provided the documentation required for the permit application and managed the whole process on behalf of the client. There was also an identified client risk in terms of future liability for ground contamination, which Delta-Simons helped reduce. Delta-Simons identified that the project would be classed as a ‘Schedule 1’ development under the Environmental Impact Assessment Regulations and therefore would require an Environmental Statement. Delta-Simons produced this along with supporting environmental assessments and planning documents for an EIA submission. Along with our employee’s local and technical knowledge, we liaised with the local authority, Natural England, the Environment Agency and other stakeholders to produce both the Environmental Statement and Environmental Permit application. The team assisted in a variety of technical assessments, including air quality, ecology, ground investigations, acoustics, landscape and visual, heritage and transport. We provided one point of contact for all the disciplines covered, which ensured efficient communication between the environmental discipline teams and the client. Throughout our assistance on this project, our local knowledge, research, field surveys and engagement with local third parties provided us with an understanding of the local environment and potential impacts. This allowed us to provide commercially and environmentally aware design advice that reflected the local needs. We also aided the reduction of high infrastructure costs involved through finding inventive solutions to the internal road network and drainage design. Our advice on the proposal led to changes including amendments to access, layout and building size revisions that reduced design inefficiencies and improved safety. Our Environmental Planning team designed an emission stack combination to reduce visual and air quality impacts which also reduced the cost to the client through reduction of future material costs and minimising the number of continuous monitoring locations required. See all Environmental Planning services. Environmental Planning and Development aims to support clients through the different stages of the development lifecycle, ranging from initial constraints mapping through to technical support on planning site delivery. The Ecology team supports clients, particularly those involved in the acquisition, management or development of land, who require expert advice and practical implementation of ecological mitigation to challenging ecological constraints. Delta Simons Arboriculture team offers a full range of arboricultural consultancy services supported by over 20 years’ experience in both private and public-sector roles. Our highly skilled Arboriculturists are Quantified Tree Risk Assessors (QTRA) registered users and members of the Arboricultural Association (TechArborA). Simon Joined Delta-Simons in early 2017 with significant experience gained working in a diverse range of sectors in the town planning field over the past 11 years. He has managed multidisciplinary teams and delivered projects for private developers, co-professionals and public sector clients throughout a wide range of industry sectors. His key experience includes managing major and complex planning applications, advising on site feasibility, leading on technical environmental planning matters along with preparing, reviewing and submitting Environmental Statements (EIA), sub EIA documents (including screening letters and scoping reports). Simon has project managed planning appeals for the public sector, appeared as an expert witness at public inquiries on environmentally technical issues and presented to planning committees at Local Planning Authorities.